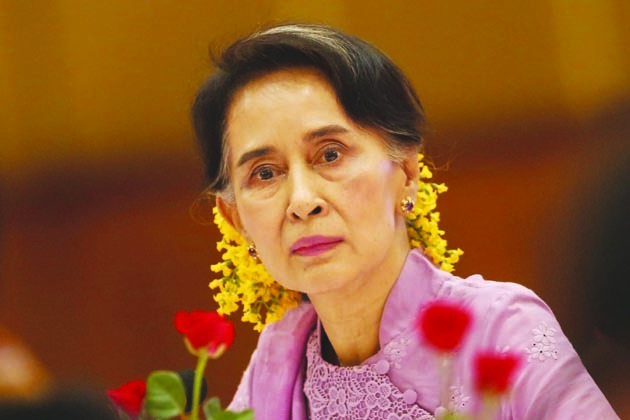 YANGON: Myanmar government leader Aung San Suu Kyi will not attend the U.N. General Assembly in New York next week, media reported on Wednesday, amid growing calls for Myanmar’s security forces to be held accountable for alleged crimes against Rohingya Muslims. Instead, two senior ministers in her government, Kyaw Tint Swe and Kyaw Tin – both seasoned diplomats who in the past defended Myanmar’s former military regime on the global stage – would attend and “explain current developments on repatriation and cooperation with international organisations”, the official, permanent secretary Myint Thu, was paraphrased as saying. Reuters’ calls to Myint Thu were not answered on Monday. Government spokesman Zaw Htay declined to comment. Suu Kyi has curtailed her overseas travel as calls for accountability have grown since some 700,000 Rohingya fled the country last year, according to U.N. agencies, as security forces launched a brutal response to insurgent attacks in August. She also skipped the assembly a year ago, just after the violence flared, after she had been expected to attend. An independent U.N. team of investigators said last month that there was evidence indicating “genocidal intent” by the military.